In former perspectives I have laid out the fundamental reasons why wage growth, dormant for decades, is on the precipice of a rebound. This thesis is based primarily on the recalibration of U.S. labor supply and demand curves. Demographic changes over the last two decades, including the shrinking working- age population and the recent decline in the female participation rate are central to this theme. However, the exponential increase in wages in emerging market economies, particularly China, also play a role as off-shore labor costs are diminishing the access of U.S. corporations to the global labor pool. These changes have enormous implications for future U.S. wage growth, and a reversal of the shrinking middle-class that we have witnessed over the past decades. They also have important ramifications for interest rates in the U.S. and will likely cause a reversal in the multi-decade bull market in treasuries. The Federal Reserve has come under fire for its interest rate projections, the so-called “dots.” Market participants continue to beat the drum that Fed forecasts are too optimistic in terms of both growth and inflation. Yesterday, Jeffrey Gundlach, in his 2016 forecast webinar, hammered Fed policy as myopic and out-of-touch with market reality. Much of his argument centered around the change in Fed policy from August to December of 2015 against a market backdrop that has actually deteriorated. Specifically, he cites continued dollar strength, and the commodity sell-off as disinflationary forces that will NOT force the hand of the Fed. Nominal GDP, he notes, is still at extremely low levels and does not merit tightening monetary policy. He also mentions the recent precedent of Central Banks tightening too soon, and the fact that all have had to reverse course and ease monetary policy after a few rate increases. Gundlach thinks that any interest rate increases over the next year will likely be reversed and history will show the recent path of the Federal Reserve, as mistaken policy. I have the utmost respect for Jeffrey Gundlach. His market interpretations are based on fundamental analysis, and a gifted scrutiny of human nature and thus a great track-record of market forecasts. However, I disagree with his commentary surrounding Federal Reserve policy, and I am in the camp, that the “dots” for 2016 will prove accurate, and that the market is currently “fighting the Fed” in a battle that it will not win. Gundlach is aware of the basis underscoring Federal Reserve policy. In his webinar, he posted a chart of the target Fed Funds rate vs. Average Hourly Earnings for the non-farm sector. I have included this chart below, because it is central to the Holbrook thesis. Gundlach cites the visible correlation between the two data series, however, thinks that Fed policy based on one data series is overly-simplistic. He also asked, “why is wage growth so bad?” logically insinuating that increasing short-term rates will slow or halt wage growth. This is the connection that I disagree with the most, because history proves that the early phase of monetary tightening does NOT slow wage growth. 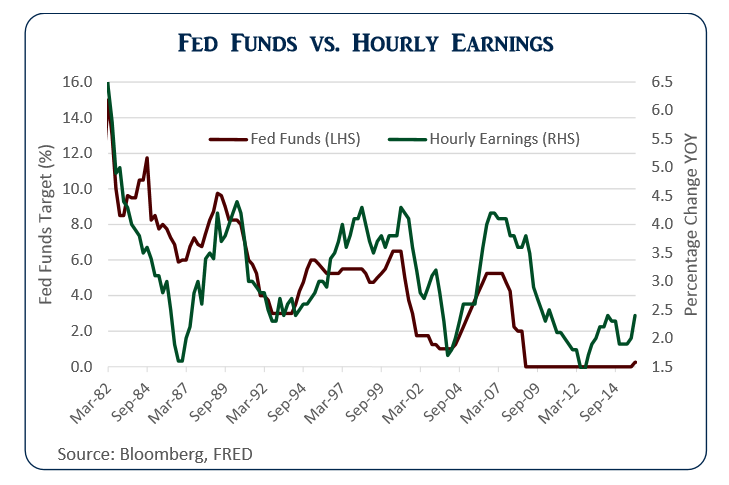 As the above chart illustrates, the Federal Reserve often waits until wage growth stops declining before raising short-term interest rates. However, due to the fact that wage growth trends tend to be extended after a reversal, the Federal Reserve usually acts quickly and methodically in response to this trend. On average, after wage growth begins to accelerate, it does so for about 4.25 years. During that period of time, it increases about 2.4% year-over-year, and is accompanied by 304 bps of Fed tightening. There is no evidence that early cycle rate hikes curtail wage growth, at least in the last three tightening cycles. Still, there is much that is unique to post-2008 Fed policy. Wage growth actually bottomed in September of 2012, and the Federal Reserve only just recently raised short-term rates, waiting much longer than historical precedent would suggest. This is due to many factors, but most obvious is the amount of time that it took to unwind Quantitative Easing without shocking international markets. The Fed signaled that it would wind down Quantitative Easing and begin to normalize policy only six months after wage growth had bottomed. Many contend that the removal of Quantitative Easing in itself was a 200-300bps tightening mechanism. I would argue with this reasoning, especially as it pertains to wage growth, because I contend that QE had little stimulating effect on the real economy, even though it incentivized the growth of corporate debt, stock buy-backs, and asset inflation. In terms of real money in the system, the policy failed. In fact, excess reserves sitting at the Fed are at about the same level as cumulative QE. The cash injected into the system by the Fed never made it into the economy. So where does that leave us now? It leaves us with a Federal Reserve that is behind the curve. At this point in the wage growth cycle, the Fed should be in the middle innings of tightening. However, because of its need for transparency, and to unwind QE, initial rate hikes took longer than perhaps the Fed had wanted. Wage growth has bottomed, and the Fed realizes that early cycle rate hikes are unlikely to reverse this trend. Gundlach criticized the Fed for their 2% inflation rate projections in the face of 200 bps of tightening. But history shows that this is indeed possible after wage growth has bottomed. Another important point is that the Federal Reserve has a responsibility to react to these trends. After all, they have a duel mandate: growth AND inflation. Historically, they have done a decent job balancing these mandates. In fact, economists will be hard-pressed to find a correlation between wage growth and inflation, because there isn’t one. Why you might ask? Because the Federal Reserve adapts its policy when wage growth trends reverse in order to stave off possible inflation risks. This is what they are doing right now, and as long as wage growth continues its upward trend, for which there is historical precedent, they will continue to do so. They will raise rates four times in 2016, and it will not restrict wage growth, and it will not push the economy into recession. If wage growth falters, they could potentially reverse course, and Gundlach will be correct, but there is no historical precedent in the U.S. for this occurrence. The title of this piece is “Wage Growth, the Fed, and Market Hubris.” We have addressed the importance of wage growth on Fed policy. We will now address the seemingly huge gap between market expectations and Fed projections as they pertain to interest rates. As I write this piece, the Fed Funds future markets are predicting that short term rates will be 68 bps points in December of 2016 (only 32 bps of tightening this year). Meanwhile, the median Fed forecast is for 1.375% (100 bps of tightening this year). 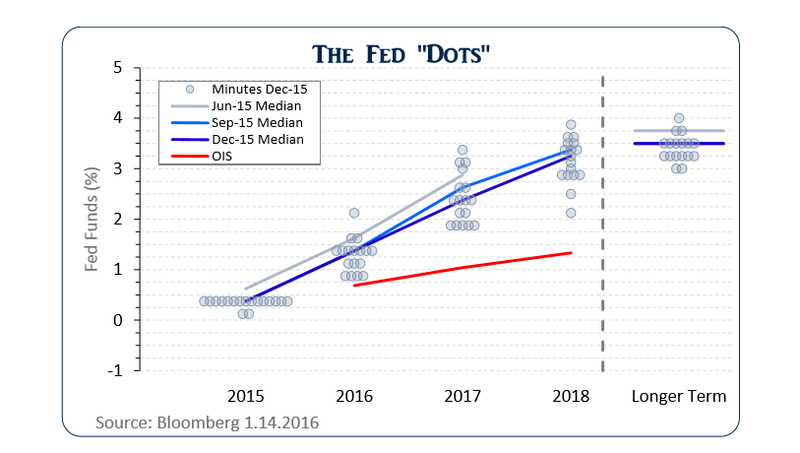 Market projections diverge even more glaringly from Fed forecasts the longer the time frame. By December of 2018, Fed Funds Futures are pricing in short-term rates of 1.38%, a full two percentage points below Fed projections. Everybody is fighting the Fed, as evidenced by the chart below. The reasons for this dichotomy are plenty. The Federal Reserve, over the past four years, has continued to move the goal posts in response to economic data. Initial rate hikes were supposed to occur when the unemployment rate hit 6.5%, then 6%, and then when the labor participation rate rose. The headline inflation rate has continued to stay meaningfully below their own self-professed two percent target. For all intents and purposes, the market is treating the Federal Reserve like the proverbial “boy who cried wolf.” Market participants continue to cite numerous reasons why the Federal Reserve cannot continue on their projected path: Commodities are crashing, China will suffer a hard landing, dollar strength has already tightened monetary conditions. The list goes on-and-on, and while there is some merit to these arguments, the Federal Reserve is going to concentrate on what they always do, wage growth. The U.S. economy is 68% consumption, and the marginal propensity to consume in the United States is well-above 90%. The money-multiplier effect means that these wages will be recirculated, which increases economic growth. And increasing economic growth brings the threat of inflation. The Federal Reserve knows this. They have a consistent track record of raising rates in the face of accelerated wage growth. Why should this time be any different? For all of the talk of the “new normal”, and “one-and-done”, and the “global slowdown,” has the make-up of the U.S. economy changed all that much? The answer is no. It is driven by the consumer, and despite the anemic wage growth of the last few decades, consumer balance sheets are stronger than they have been in quite some time. The market is currently fighting the Fed, and it is precisely this hubris that could result in a massive recalibration of interest rates, higher. After all, the two largest holders of treasuries, the Fed and China, have become net sellers. New buyers will have to continue to buy-in to the notion that weaker Chinese growth, and the commodity crash, will sink the U.S. economy. As soon as that is debunked in the mind of investors, the gig is up. Rates will move higher. We think that Fed projections will for 2016 will come to fruition for the short-end of the yield curve. Wage growth will continue to accelerate throughout the year as the job market continues to tighten. The Federal Reserve will raise rates once a quarter in response to this growth and end the year with an effective Fed Funds rate of 1.375%. The projection for longer-term rates is a bit more involved since longer term rates are dependent not only on the market’s projection for shorter term yields but also a treasury term premium. The term premium is the compensation demanded by investors for bearing interest rate risk, which is the risk that interest rates will change over the life of the bond. 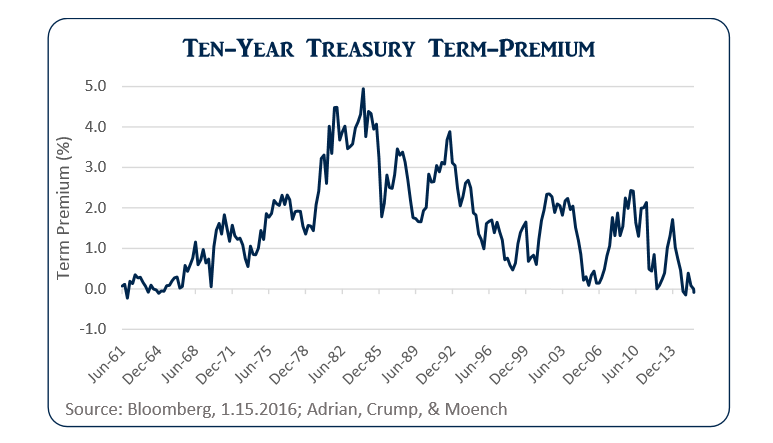 Interestingly enough, the ten-year term-premium is trading at multi-decade lows. Tobias Adrian, Richard Crump, and Emanuel Moench, researchers at the Federal Reserve, have developed a model that tracks the treasury market premium. The results of their model are illustrated in the chart below. The current term-premium demanded by investors is actually negative (-.087%) suggesting that longer term treasury investors are actually paying for future interest rate volatility, a curious fact. Negative term-premiums are incredibly rare. In fact, the last time this measure was negative was in the early 1960’s, when the ten-year yield languished around 4%. The next couple of decades saw this rate increase to the mid-teens, and only 5% of that increase can be attributed to an increase in the term premium, the bulk of the increase coming from rising market projections for the path of shorter-term rates. Currently, investors face a treasury bond market that is not only projecting shorter term rates to be much lower than the Fed’s projections, but they are not being compensated at all for the prospect that they may be wrong. This sets up for a perfect storm, and a potentially devastating recalibration of rates across the yield curve. How is this going to play out? As the Federal Reserve sticks to its forecast and continues to raise short term rates, the market will begin to adjust its expectation for the future rate path. This will cause an initial bump in longer term treasury yields. However, given the disparity between the market and the Fed, I think that the market will view the Fed’s actions as a policy mistake and disinflationary. This will provide tailwinds for longer-term treasuries and cause flattening in the yield curve. Longer-term rates will not rise substantially until the market realizes that wage growth acceleration is intact, and commodity prices bottom. As this realization becomes more engrained in the mind of market participants, yields on the long-end of the curve, could rise precipitously as the term-premium rebounds from decade-low levels. 2016 will be an inflection point, whereby the resolve of the Federal Reserve transitions market psychology from “the Fed is the boy who cries wolf” to “the Fed is reacting to domestic economic strength and accelerated wage growth.” Such a transition will bring about volatility—in both equity and fixed income markets. However, by the end of 2016, we expect this transition to be well under way. 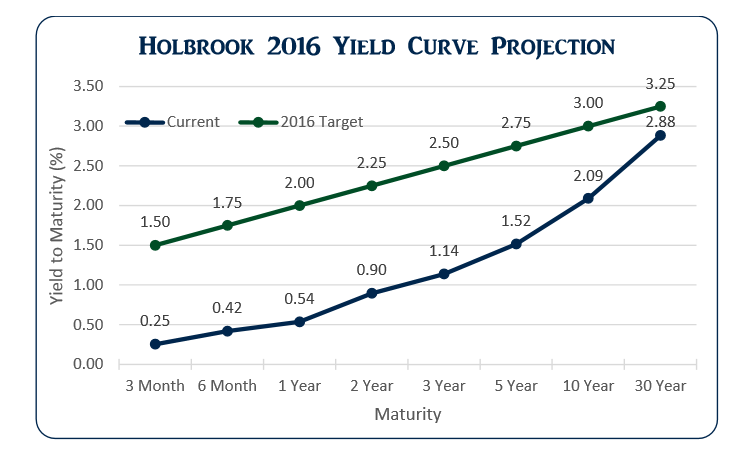 Holbrook views the short-end of the curve as the most vulnerable in 2016. The market will recalibrate as the Fed raises four times during the year. Ten and thirty-year yields will increase, however, at a slower pace since Fed resolve will be questioned my market participants, even criticized as a policy mistake. I do not see it as a policy mistake, as the Federal Reserve is already behind the curve. The real mistake would be to continue the monetary repression of the last five years in the face of accelerated wage growth, and an improving economy. Since 2010, the ten-year term premium has averaged 88 bps, almost a full percentage point above current levels. However, my intuition is that this premium can stay low over the course of 2016 since the Federal Reserve is not being taken seriously by market participants. The term-premium recalibration will be a 2017 event, as economic data reveals that 2016 market positioning is wrong. Wage growth bottomed in 2012 and has recently broken out of its post-recession range. The Federal Reserve is reacting to this, as they always have, by raising rates to stave-off the potential inflation that could arise from accelerated wage growth. As long as wages continue to rise, the Federal Reserve will stick to its economic and rate projections. Meanwhile, the market is aggressively fighting the Fed, setting up a potential severe recalibration of interest rates to the upside. 2016 will be a year of yield curve flattening, as market participants readjust their shorter-term yield projections, but view Fed policy as a mistake. Future parallel and steepening yield curve shifts will only occur after economic data continues to improve and affirms Fed action.